Fast, secure, and reasonably priced - that's what auralis means to your business. As a german IT specialist we are dealing with mobile security for years. 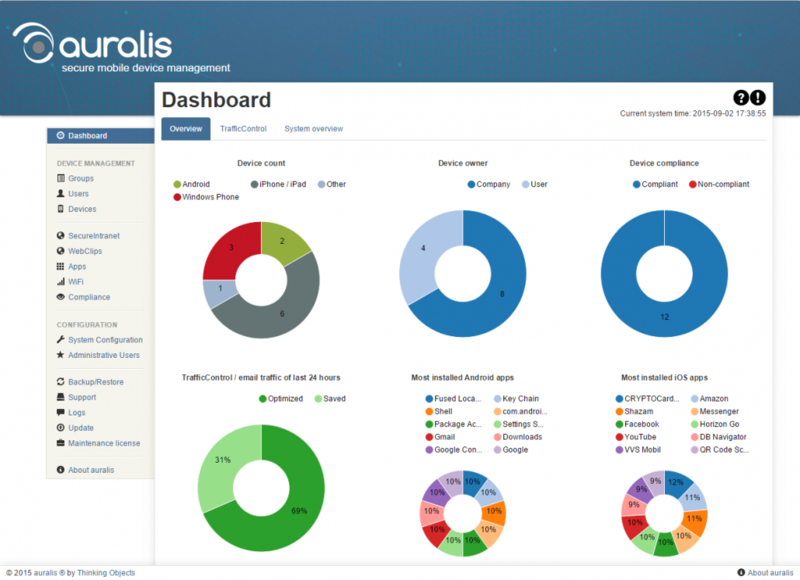 auralis is a specialized solution for mobile device management (MDM) and mobile device security (MDS). Starting with only 15 users, you get a lot of useful features for a small price. Using the built-in unique e-mail compression our mobile device management and mobile security solution saves up to 90% of the data traffic. By reducing the size of PDF, pictures, or Office documents attached to mails without loosing readability and details on your mobile device you wave good-buy to expensive mobile data plans and high roaming costs. By authorizing single devices with a simple to use internal certification authority (CA) and using the power of SSL encryption your employees access their mail, calendar, contacts and tasks stored in your ActiveSync enabled groupware like Microsoft Exchange or Zarafa Server. auralis provides seamless integration of mobile devices into your everyday work without making security compromises. By integrating auralis in your security perimeter every member of your staff has access to vital business information from anywhere without the company loosing control over this data. With the administrative user interface you assign individual rights to different users. This makes adjusting auralis to your security policies and needs very easy. With the automatically inventory built by auralis you can see all mobile devices accessing internal data in real-time. With auralis you license users with one ore more mobile devices instead of every single device. This makes the solution more attractive than others and saves money compared with other enterprise mobile device management solutions. Take the chance to test auralis now for free without obligations! Just get in touch with us to get more details if needed. In modern Times, Mobile Security is very important. Luckily, we have some companys who are securing our Phones. Especially for other Companys, Mobile Security can be very useful if you have some secret informations.